Students match the rhyming pictures on the heart halves. Students use letter tiles to spell the 3 and 4 letter words. Level 1 : Students fill in the first letter of the word. Level 2 : Students fill in the middle sound. Level 3 : Students spell entire 3 letter word. Level 4: Students spell the entire 4 letter word. We can recognize and produce rhyming words. 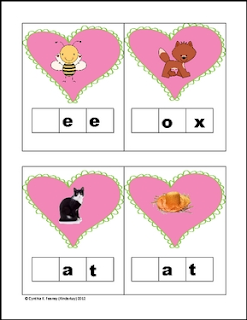 We can isolate and pronounce the beginning, middle, and ending sounds in CVC words.